"Pacific" redirects here. For other uses, see Pacific (disambiguation). ^ a b "Pacific Ocean". Britannica Concise. 2006. Chicago: Encyclopædia Britannica, Inc.
^ Japan Atlas: Japan Marine Science and Technology Center. Retrieved on 2007-07-04. Napier, W.; Gilbert, J., and Holland, J. (1973). Pacific Voyages. Garden City, N.Y.: Doubleday. ISBN 0-385-04335-X. 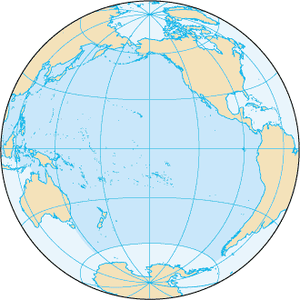 The Pacific Ocean is bounded on the east by the North and South American continents; on the north by the Bering Strait; on the west by Asia, the Malay Archipelago, and Australia; and on the south by the Southern Ocean. In the southeast it is arbitrarily divided from the Atlantic Ocean by the Drake Passage along 68° west longitude; in the southwest, its separation from the Indian Ocean is not officially designated. The largest landmass in the Pacific Ocean is the continent of Australia, which is approximately equal in size to the 48 contiguous U.S. states. Almost all of the smaller islands of the Pacific lie between 30 deg north and 30 deg south latitude, extending from Southeast Asia to Easter Island; the rest of the Pacific Basin is almost devoid of land. In the southwestern corner of the Pacific lie the islands of Melanesia, dominated by New Guinea.